In the past seven days, I have left my house exactly two times. Granted, the two times I ventured out were for really important reasons. On Saturday, we had Christmas with Nathan’s dad and family. Then, on Sunday, Nathan declared he was going to Braums for a burger. I slid out to the truck in no time flat wearing my pajama pants and Old Navy t-shirt with a hole in the front. I mean, if you are going to risk sliding off an icy road or into on-coming traffic there should certainly be a cheeseburger involved and you should be dressed for the occasion. Unfortunately, the road in front of our house still looks like an ice skating rink and I’m just not a risk-taker when it comes to driving. So… today, I got a little bored. It didn’t help that Nathan returned to work today and our holiday company left yesterday morning. Angee made the mistake of telling me she is coming up to see me later in the week to show me her brand new camera. She mentioned Thursday, which seems so far away. So, I decided to make a chocolate cake to see if I can entice her to show up a little earlier. This recipe is also proof that I really should not be left alone to entertain myself. This also means that tomorrow I will be staring down a chocolate cake all day. It will look at me. I will look at it. It will say, “C’mon, I’m a great breakfast food.” I will look at my oatmeal and weep. I don’t have a chance. Angee, if you are out there, you must come save me from myself — and this cake! And, you better hurry or there won’t be a crumb left for you! 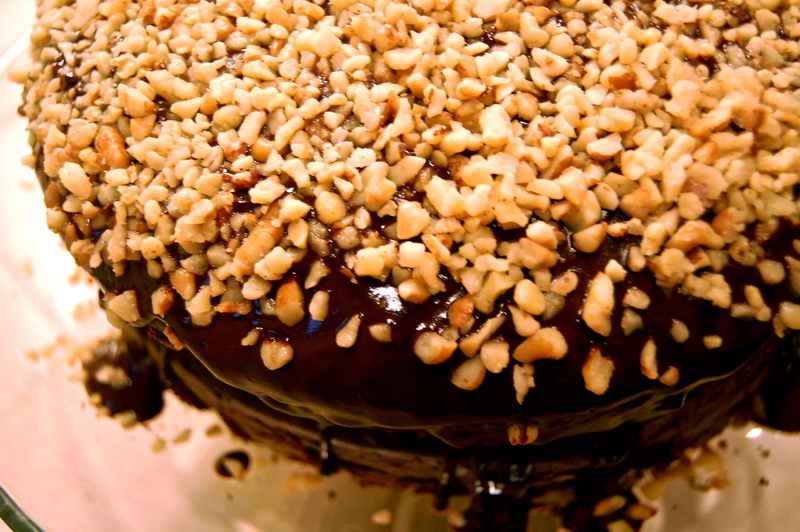 I found countless recipes for chocolate cakes and this one is really a basic one. I like that it is pretty simple. I changed the recipe a little bit by using cake flour instead of all-purpose and the next time I make it, I’m going to use steamed milk to mix with the cocoa powder. Preheat oven to 350 degrees Grease 2 – 9 inch round cake pans. Sift together remaining dry ingredients and set aside. In a large bowl, cream butter and sugar together until light and fluffy. Beat in eggs one at time, and then stir in vanilla. Add the flour mixture alternately with the cocoa/water mixture. Use mixer to incorporate it all in the end. Bake in preheated oven for 30 to 40 minutes. Allow cake to cool while you prepare chocolate glaze. Melt chocolate chips and butter in a small saucepan over medium low heat, stirring until smooth. Remove from heat, and then stir in milk, honey and vanilla. Set aside to cool slightly. 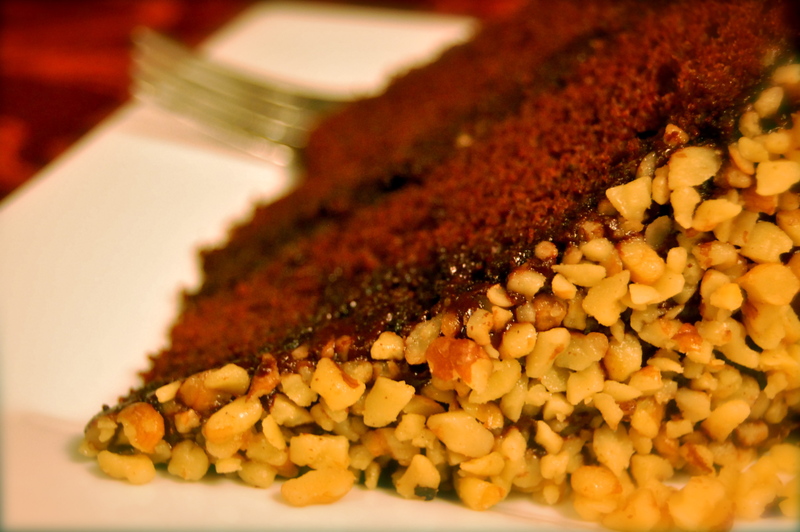 When cakes are cool place one cake on serving plate or cake stand and pour a little more than 1/4th of the glaze in the center and sprinkle with finely diced walnuts. Place second cake on top and make sure it is centered. You can trim up the cake to make sure it is even if you like. Pour remaining glaze onto the center of the top cake and use a flat spatula to make sure the icing drips down the sides of the cakes. Sprinkle the top and sides of the cake with the walnuts. Here is something I didn’t know until today when I discovered I didn’t have baking powder and had a minor meltdown in my kitchen. I found that you can replace baking powder with two parts cream of tarter and one part baking soda. I just mixed together 1 teaspoon of cream of tarter with ½ teaspoon of baking soda and then added ½ teaspoon of the mixture to the dry ingredients and it worked. Of course, I know what you are thinking … who has cream of tarter, but no baking soda? Well, Nathan does, that’s who! Oh heeeeeeeck! This is not what I need to see right now. Maybe this will be a bake and take – bake it, take a bite and take the rest to someone will a smaller hiney. This was an evil cake! Thanks for the comment Amy. I enjoyed your daughter’s rendition of the Tom Waits song — Come on up to the House. I’ve been singing it over and over in my head for two days! Love it!! Who knew you could cook like that. Are you sure you didn’t venture out to one of the Bakeries. Snow has really gotten to you.